Cloud Foundry is quickly becoming one of the leading open source communities for cloud computing. In this newsletter, we are pleased to have a series of articles describing how developers can use Eclipse and Orion for developing Cloud Foundry applications. Check them out. 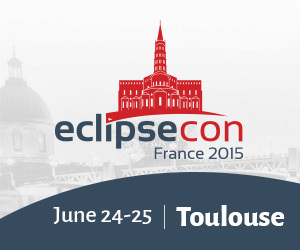 We are counting down the days to EclipseCon France. Registration is now open and the schedule will be published soon. We hope to see you in Toulouse in June. Be sure to participate in the last round of the Great Fixes for Mars competition. The final deadline is May 6. Discover the functions and extensions provided by the Cloud Foundry Eclipse Tools. 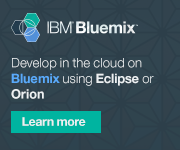 Begin developing Cloud Foundry apps using Bluemix and Orion today! Find out how easy it is to create and deploy a Spring Boot app to Cloud Foundry. This has been a difficult call, but we are happy to finally be able to announce the three winners of our Open IoT Challenge! The first release of OM2M is now available for download. Congratulations to the winners of round two! Final deadline is May 6. XtextCON will take place May 18-20, in Kiel, Germany. Copyright © 2015 The Eclipse Foundation. All rights reserved.